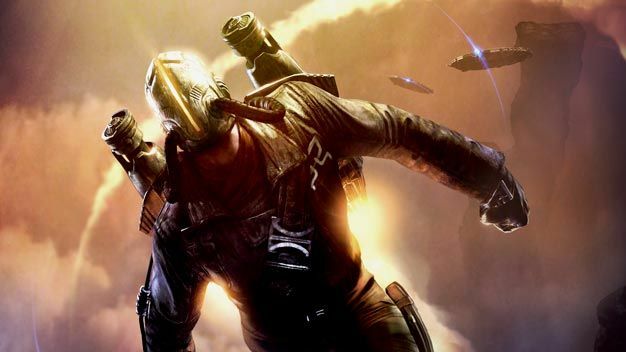 Word came down from Capcom and Plan B Entertainment that a deal has finally been struck to make Dark Void, the vertical third-person shooter with golden jetpacks, into a major motion picture. Before even seeing how the game is received by the target audience, the film rights are being developed for a sci-fi action franchise and could possibly star Brad Pitt. Very convenient, seeing that Plan B Entertainment is his production company. The game is centered around a pilot named Will who crash lands inside the Bermuda Triangle. He awakens to find himself in The Void, an alternate world with a striking resemblance to primitive Earth, except with aliens and high tech gadgets. Will must fight the powers that be with a rag-tag faction of humans, who have also wound up in The Void through various other means, using the aliens’ own technology to defeat them once and for all, thus keeping order. Oh, and there will be jetpacks; lots and lots of jetpacks. Confused about the plot? Our patent-pending TVGB story de-mystifier will clear things up. Think of it as if The Rocketeer and War of the Worlds had a baby, that baby grew up in a dysfunctional foster family and then married Lord of the Flies. Wow, I think I just psyched myself up for this movie on accident.